P.E. Bruce B. Cloud Sr.
Bruce Cloud spent most of his professional career working for the H. B. Zachry Company, a leading construction firm based in Texas. He was president of the company from 1987 to 1993 and vice chairman of the board from 1993 to 1994. In the early 1960s, the company began a magazine called The Zachry Way which became the vehicle for Cloud’s regular column, “From the Manager’s Scratch Pad.” Cloud authored 136 articles between 1962 and 1992 and was asked to write one last installment in 2006. Bruce Cloud died in 2007 at the age of eighty-seven. Most of Cloud’s brief articles from The Zachry Way are included in this book, which is edited by his son. While the book is a fitting tribute to the senior Cloud, the articles have additional relevance from two vantage points. First, they offer an interesting historical perspective on three decades of business from the point of view of a manager in a non-glamorous industry sector. Second, Cloud’s articles set a standard for communicating with employees that could benefit every manager. 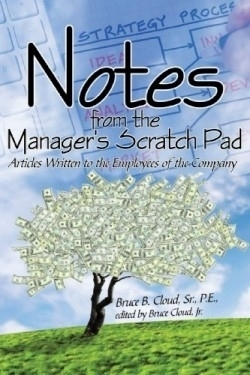 Bruce Cloud had the rare ability to convey management’s opinion to employees without being pedantic or condescending. His messages were always simply written, uplifting, and positive, but he wasn’t afraid to tell it like it is. Reading Cloud’s “Notes” will provide managers and employees with a model for how to honestly and openly communicate with one another.